Most fasteners are available by the 100 or per pound. Larger sizes are available in smaller quantities and all are available in larger quantities. 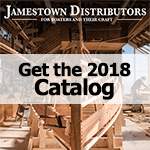 Jamestown Distributors is a large supplier of Stainless Steel marine fasteners, including but not limited to grommets and rivets, nails, screws and washers. We carry a full supply of Stainless Steel hardware and fasteners. Stainless Steel screws are the work horse for modern boatbuilding or exterior woodworking applications. They provide great corrosion resistance while remaining affordable. Hardened steel screws are more common in the woodworking environment but cannot be used in a corrosive environment. Stainless steel is available in a wide range of engineered grades, each with its own designation number and specific properties. Only a few grades of Stainless Steel are suitable for fasteners--those that can be cold headed easily and have adequate torsional and shear strengths. The 300 series stainless steels are the most popular -- 18-8 grades contain very little carbon, about 18% chromium and 8% nickel -- giving them good corrosion resistance. In our opinion, 304- and 305-series stainless steel is not that much of a step-up from 18-8. But, 316 series stainless contains molybdenum, which significantly increases corrosion resistance, strength and of course the cost. Use Stainless Steel screws cautiously below the waterline. Stainless Steel Screws cannot be in an anaerobic environment. If the screw is immersed in what is called still water, with no oxygen the corrosion-resistant film, chromium oxide, will not be allowed to form. Without the chromium oxide film the screw will suffer from galvanic corrosion and eventual failure. Galling-- When using stainless steel nuts and bolts especially when they are larger in size always remember to lubricate with an antiseize compound (Tef Gel). This will prevent the nut from binding on the thread (known as galling or cold-welding). Our silicon bronze fasteners come in a variety of combinations of alloys, but most commonly a compound of copper, tin and silicon. When replacing copper hardware on boats, traditionalists turn to silicon bronze more than 90% of the time. Again, it is stronger than brass, so when rebuilding a cat boat, the students and experts at the Newport International Yacht Restoration School choose silicon bronze fasteners and hardware on a daily basis. When working with pressure treated wood, it is important to remember that pressure treated wood now contains six times the level of copper as it did before 2004, making it much more corrosive to common steel. Fasteners used with pressure-treated lumber should always be double hot dip galvanized steel, Stainless steel, silicon bronze, or copper. Brass or aluminum fasteners should not be used with waterborne preservatives. In structural applications where a long service life is required, stainless steel, silicon bronze, or copper fasteners are recommended. In long term corrosion testing conducted by the Forest Service division of USDA on fasteners used in CCA treated wood, only stainless steel nails and screws exhibited virtually no visual signs of corrosion and negligible weight loss over a fourteen year period.